Healthy Ride is creating a series of rider profiles to feature some of our riders and showcase how they use the system. If you would like to be featured, please fill out our survey. 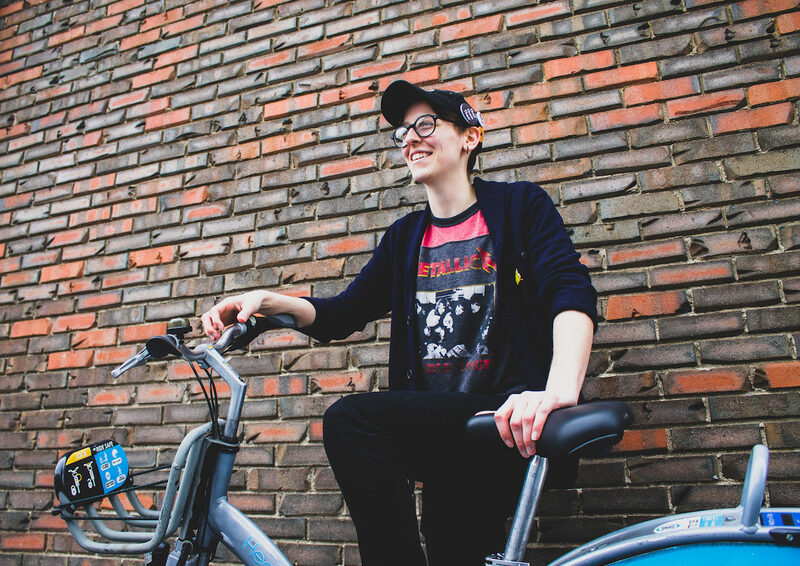 Samone was the Communications Coordinator at Healthy Ride from 2015 to 2018. They managed the Healthy Ride brand by producing graphics, social media content, and photography. They were also known for playing Rebecca Black’s “Friday” in the office to let everyone know what day it was. Did you bike as a child, and do you have any biking memories? I did bike as a kiddo in Virginia. It was mainly a way to get back and forth between my best friend’s house and Big Lots where we would buy candy and energy drinks. Then we found a dirt path in the woods with a real good jump, so we started biking to see who could go the highest over the jump. My best friend wiped out pretty good, but that didn’t stop us. How long have you used the bike share program, and how do you use the bikes? However old Healthy Ride is, so like 4 years now? I’ve used it in a lot of ways over the years. For a while, it was my main mode of transportation to get to work. When I moved, I still used Healthy Ride to do one way trips—like when I bike to the bar and then walk or Lyft home. What year did you start cycling? I started Healthy Ride cycling in 2015 but didn’t ride a non-bike share bike until 2016. What are your favorite places to bike in Pittsburgh, and why? I love biking anywhere there is a bike lane so I feel comfortable and safe enough to bike carefree. There seem to be more and more places like that in Pittsburgh. Convenient, affordable transportation is super important to me and Pittsburgh’s growth! I love biking with friends. Sometimes I rent bikes with my friends so we can go play Pokemon Go and hit more pokestops. I wouldn’t have started biking if it wasn’t for Healthy Ride. I rode Healthy Ride bikes for over a year then I bought my own bike. Now, I bike almost every day and it has improved my physical and mental health. The independence that comes with riding a bike is important to me. I don’t have to worry about car insurance, gas, bus schedules, or traffic—I can just get where I need to go. Gosh darn, I love Healthy Ride.